The Hausa people, although they are found in a diverse number of countries extending from Sudan to Nigeria, have had a great influence on the food culture of West African street foods. One such food is a popular street food often eaten for breakfast. It is known as Hausa Koko, a soured and spicy smooth porridge. The sourness, resulting from fermenting the millet, may be an acquired taste. However, after trying a few regional African cuisines, you will find that fermented products are used quite regularly. Scoop about 1/2 a cup of corn dough and place into a pan. Add 1 cup of cold water and crumble up the corn dough to make a smooth paste with the water. Turn on the heat to high and stir continuously. Add 2 cups of boiling water to the pot and bring to the boil whilst stirring continuously. At this point, the corn dough begins to thicken and form gelatinous looking lumps. I normally keep a whisk handy to aid in the smoothing out of the porridge. Add a pinch of salt, the ground cloves, ginger, and pepper. Stir and allow to simmer for 10 minutes on a low heat. When ready to serve, pour into a bowl, add the desired amount of sugar and stir. For an added touch of luxury, pour in some evaporated milk. 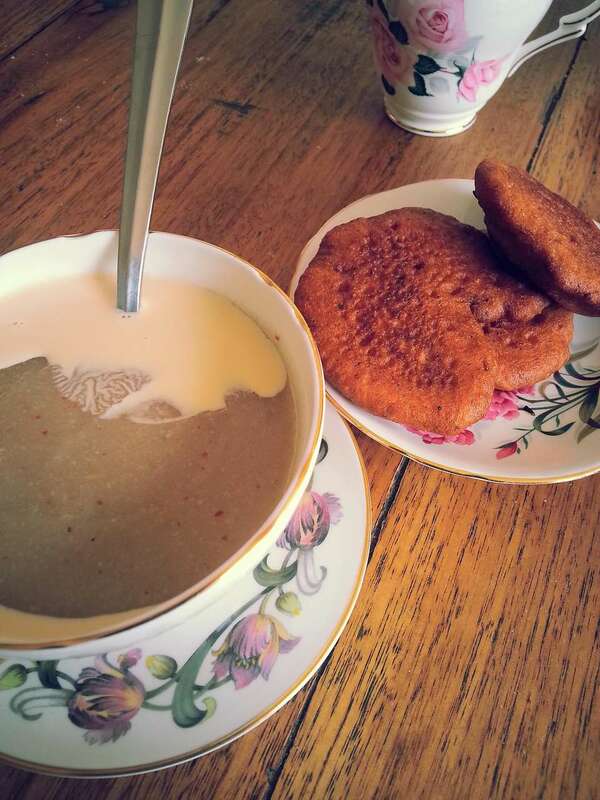 Traditionally, Hausa Koko is served with fried bean cake (koose or akara) or doughnut known as bofrot or puff puff.